When we fight for immigrant rights and let our voices be heard let us always remember who we are speaking for. To find out more about the work they do click here on Border Angels . HOLTVILLE, Calif. — They could have been anybody — a talented musician, a farm worker, an unemployed teacher, a desperate parent, a son or daughter looking to feed their mother, brothers and sisters. Whoever they are, their identities are now shrouded beneath the saline terrain that surrounds the town of Holtville, just west of Arizona and less than an hour from the Mexican border. Most of the John and Jane Does buried here were found dead, their bodies strewn across the desert hills of Imperial Valley, or along the All American Canal that feeds a sprawling agricultural expanse extending from El Centro, Calif., to Mexicali, Mexico. No one knows who they are and few seem to really care. Nov. 2 marks the Mexican holiday known as Día de los Muertos, or Day of the Dead, when families traditionally gather to honor those who have gone before. This year a handful of immigrant rights activists and community members gathered at Holtville’s Terrace Park Cemetery, near the site of dozens of unmarked graves, to celebrate and to mourn. Partially obscured by a six-foot wall are rows and rows – 49 to be exact – of crosses with simple, mud-colored bricks delineating the final resting place for these would-be migrants. “None of the people buried here expected to end up like this,” says Enrique Morones, head of the non-profit organization Border Angels. Founded in 1986, the organization provides humanitarian assistance to migrants living in the canyons of North San Diego County. For several years it has also helped recruit volunteers as part of a campaign to leave bottles of water in areas identified as crossing points for undocumented immigrants. “Most undocumented migrants are not aware of the perils of the desert. They are also easy prey for unscrupulous smugglers that rob them and then leave them lost on their own in a place where north and south are indistinguishable,” adds Morones, as he leaves a few gallons of water at a strategic point marked by a blanket hanging from a small shrubby tree, known as a huizache. “No one can survive more than two hours under 115-degree heat during the summer,” explains Border Patrol Officer Adrian Corona. “Winter is equally dangerous,” he says, adding that the mountainous terrain is especially treacherous at night and brutally hot in the day. Most don’t make the trip, he says. Under high heat and with no water, the body enters into a state of shock, the vital organs gradually shutting down. People in this state will experience hallucinations – also described as the “oasis effect” – before collapsing in a delirium. The “coyotes,” meanwhile, who are essentially paid guides for migrants looking to head north, often warn fellow travelers not to stop for those showing signs of dehydration. Since most border trips are made at night, it’s common practice for coyotes to abandon stragglers. BOARSTAR (Border Patrol Search, Trauma and Rescue Unit) agents operating in the Imperial Valley say they have performed 30 emergency rescues this fiscal year, down from the 50 performed the previous year. Corona and his fellow border agents attribute the decline to improved technology, which is making it easier to track movements across the desert. “Not only can we better chart their point of entry, but it is becoming more common for migrants to dial 911 [in an emergency] and through the GPS signals we get from their phones, we can get to them before it becomes critical,” explains Corona. Still, a majority of undocumented immigrants are unlikely to carry cell phones. And even if they did, the fear of getting caught and facing potential sentences of between three and five years would deter them from making that call. It also means that many don’t carry identification. “The problem is that most of the time their bodies are found days, weeks, or years after they die. 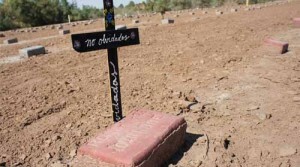 Sometimes authorities only find a femur or just a few bones,” said Jesus Gutierrez, head of the Legal Protection department for the Mexican Consulate in Calexico. In such cases, legal protocol requires authorities to contact the Mexican consulate in a specific jurisdiction and work in tandem with them to try to ID the deceased. In cases where identification is not possible, the coroner’s office saves samples of the remains with a view toward future DNA identification, which is costly and done sparingly at best. Immigrant rights advocates like Morones warn in fact that with the growing trend of mass deportations, carried out with particular zeal under the current administration, migrants are becoming more desperate to return, with greater numbers likely to perish under the desert sun. According to official figures, between January and June 2011, the U.S. government has carried out more than 46,000 deportations of parents whose children are U.S. citizens. While there is no solid government data regarding the number of children left behind, the New York-based think tank Applied Research Center, which works to foster racial justice, estimates that at least 5,100 children have ended up in foster homes. In the next five years, says ARC, that figure could reach 15,000. “Do you think those parents who have been deported will remain in their countries knowing that their children are here?” asks Anita Nicklem, who lives in the Imperial Valley and attended the ceremony at Terrace Park Cemetery. “Of course not. They will do whatever they can to come back and of course they will risk their lives in doing so,” she says. Photo by Andres Rafael Luevano.